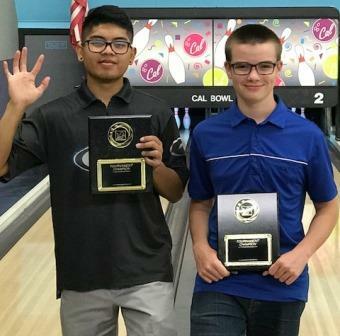 Anthony Cando and Joey Queller wrapped up the 2016-17 So Cal Conference season with big wins in jam-packed action at Cal Bowl in Lakewood. Joe Grondin, returning from Wichita, needed a top 10 finish to get into the following day's Invitational, and succeeded by making the top five, and then opening the scratch finals with a 234-188 win over Kyle Reed. Brandon Wanders then edged Grondin 192-182. Anthony Cando then turned the tables with a 205-172 win over Wanders to advance to the title match. Top seed Kyle Gilbert was leading a scratch singles event for the first time, and the veteran Cando would give him no rook to acclimate to the situation. On the low scoring pattern, Cando came up with a sbig string to beat Gilbert 257-188 and earn the fifth title of his JBT career (as he attempted to indicate above). Solomon Salama's sister Yael stole the show in the handicap division, making her first finals and then winning round one of the finals with a 217 game that beat Megan Carpenter and William Robbins. Kyle Perry then stepped in and fired 248, beating Salama (196) and Aislinn Lubag (188). A great semifinal saw Perry's 198 edge Jeff Rodda's 187 and Avery Domaguin's 177 to advance to the title match. Top seed Joey Queller missed much of the season due to ROTC commitments, but he is a force when he bowls, as he showed by leading the large field. Perry has been oh-so-close to victory many times, and unfortunately for him he had to settle for the runner-up spot again, as Queller won the match 234-208 for his second career JBT title. Solomon Salama kept up his dominance in the U17 events, beating Mojave U17 standout Cerell Cardsines for that win. Brittany Kolatzny, also dominant in the Girls Scratch side events, kept up her great final season with a win over Megan Carpenter in that final game. Big thanks to the team at Cal for hosting our event, and MSC for another amazing contribution to the day's prize fund, pushing it over the $2,500 mark. The field is now set for the So Cal Invitational, featuring over $5,000 in scholarships and Bowler of the Year titles on the line!